With hundreds of different solar panels on the market it is difficult for those not in the industry to identify quality panels which will perform over the expected 25 year life of a solar photovoltaic (PV) system. Here we highlight the best quality solar panel manufacturers using the latest solar cell innovations to develop the most efficient and reliable panels with the longest life and highest performance. get our free "guide to buying solar"
What is a Tier 1 Solar Panel? A common term that sales companies and manufacturers use is the 'Tier 1' rating. The Tier rating was developed by Bloomberg New Energy Finance Corporation and is basically used to rate solar panel manufacturers in terms of financial stability. Unfortunately a Tier 1 ranking does not mean a panel offers the highest performance or quality. With most established panel manufacturers now rated as Tier 1, it is more important than ever to know how to distinguish a high quality and reliable panel by other means which we explain in more detail in our solar panel quality review. Below is our list of the best solar panels available in Australia based on quality, performance, innovation and value, along with feedback from solar industry professionals. See our detailed solar panel quality review here. In summary SunPower, LG and Winaico are generally regarded the best quality solar panel manufacturers with longest warranties, highest efficiency and lowest degradation over the life of the panel. There are several other highly regarded panel manufacturers popular in the US, Japan, and across the world which are either not available, have limited supply or are very new to Australia. Here is a short list of some other renowned quality panel manufacturers. In addition to continuous feedback from our solar specialists the clean energy reviews team invite all solar industry professionals and installers to give your feedback (positive or negative) from experience with any modules. Here we highlight many of the latest solar panel and PV cell technologies offered by the leading manufacturers, plus we list some of the more popular panels available on the market using these innovative features. These innovations and more explained in detail below offer various efficiency improvements, shade tolerance and increased reliability, with several manufacturers now offering up to 30 year performance warranties. With all the new panel varieties available it is worth doing some research before you invest in a solar installation. In our complete solar panel review article we explain how to select a reliable solar panel and further highlight the best quality manufacturers on the market. Solar panel efficiency is an important factor to consider and is dependent on the cell type and panel design. PV efficiency has increased over the years as manufacturers implement more of the latest cell technologies explained in detail below. See the complete list of the most efficient solar panels available on the market. There is a long ongoing debate about the superior PV cell technology between monocrystalline and polycrystalline silicon cells. Monocrystalline cells (mono) are cut from a single crystal ingot are more efficient but more expensive to manufacture. The higher cost lead the way for polycrystalline technology to become the preferred cell type used; however very recently (within the last 12 months) the cost of mono wafers has declined significantly and many manufacturers are shifting back to mono cells due to the higher efficiency. Polycrystalline cells, also known as multicrystalline or 'multi' cells, are grown from multifaceted crystalline material (grown in multiple directions) which is cheaper to produce but offers slightly lower efficiency. Both are still widely manufactured and very reliable but mono cells are considered the the superior technology in regards to efficiency. Mono cells offer slightly improved performance with a lower temperature co-efficient and a slightly lower rate light induced degradation (LID) over time. Monocrystalline cells are generally dark black/blue in colour with diamond pattern, while poly or multicrystalline cells are square edged, appear blue in colour and slightly textured. Why are monocrystalline cells more efficient? The inherent benefits of monocrystalline silicon are due to the uniform crystalline structure free of grain boundaries and lower impurities through the unique czochralski manufacturing process. In comparison poly or mulitcrystalline cells have very small but defined crystal boundaries which can act as minute barriers and can be more susceptible to forming micro-cracks after several years due to cyclic stress and thermal expansion. High Temperture Performance - Monocrystalline cells also have a slightly better temperature cofficient which results in higher performance in elevated temperature. The Power temperature co-efficient is the amount of power loss as cell temperature increases. All solar cells are rated 25 degC and slowly reduce efficiency at higher cell temperature. Monocrystalline cells average -0.38% per degC while Polycrystalline cells average around -0.41% per degC. The best performing cells at high temperatures are HJC cells from Panasonic which we describe in the last section of this review. Over the last two years PERC cells have emerged as the premium technology for many manufacturers in both mono and poly crystalline cells. PERC stands for 'Passivated Emitter and Rear Cell' which is a more advanced cell architecture. Put simply PERC uses passivation layer/s on the rear side of the cell to improve 'quantum efficiency', this means more of the light photons are able to be absorbed, thus increasing total efficiency. A common PERC technology is the local Al-BSF or local Aluminium Back Surface Field (see diagram below) but several other variations have been developed such as PERT (passivated emitter rear totally diffused) and PERL (Passivated Emitter and Rear Locally-diffused). The director of the Australian Centre for Advanced Photovoltaics at UNSW, Professor Martin Green invented the PERC concept which is now widely used by many of the leading PV cell manufacturers around the world. Q cells were the first in incorporate PERC technology into mulitcrystalline cells but use the name Q.antum for their range of PERC modules. Jinko solar recently broke the solar efficiency record with 22.04% recorded from a standard size multicrystalline p-type silicon cell. PERC technology has been available for a few years and is advancing rapidly with most leading manufacturers developing their next generation panels using variations of PERC technology. It is predicted that Mono PERC cells will become the most popular and efficient cell type over the next few years with most manufacturers including Winaico, Trina Solar, Q cells, LONGi Solar, Jinko and JA solar now using mono PERC cell architeture. Common P-type PERC cells can suffer what is known as LeTID or light and elevated temperature induced degradation. The LeTID phenomenon is similar to the well known LID or light induced degradation where a panel can lose 2-3% of the rated output in the first year of UV exposure and 0.5% to 0.8% per year after. Unfortunately losses due to LeTID can be higher with up to 6% loses in the first 2 years. If this loss is not fully accounted for by the manufacturer it could lead to poor performance and potential warranty claims. Fortunately the N-type silicon cells used by LG, Sunpower and the new N-peak series from REC do not suffer the effects of LeTID. Also several manufacturers who produce P-type poly and mono PERC cells have developed processes to reduce or eliminate LeTID, this includes Q cells who are the first to claim anti-LeTID technology on all panels. REC, Winaico, Jinko solar and Canadian Solar also claim to have reduced or eliminated the effects of LeTID. Small silver metallic fingers across each cell transfer current to the 5 ribbon busbars. Busbars are thin wires or ribbons which run down each cell and carry the electrons (current) through the solar module. As PV cells have become more efficient they in turn generate more current thus over recent years most manufacturers have moved from 3 busbars to 5 or 6 busbars. A few manufactures such as LG energy have gone one step further and developed multi-wire systems using up to 12 very thin round wires rather than flat busbars, explained in more detail below. The compromise is that the busbars actually shade part of the cell and so can slightly reduce performance if they are too large, so they need to be carefully designed. On the other hand multiple busbars provide lower resistance and a shorter path for the electrons to travel resulting in higher performance. If a cell micro-crack occurs due to impact, heavy loads or people walking on panels, more busbars help reduce the chance of the crack/s developing into a hot spot as they provide alternative paths for current to flow. LG Neon 2 cells with 12 round wire busbars. The LG Neon 2 modules where the first to use 12 small round wire busbars which LG refer to as 'Cello' technology which stands for 'cell connection, electrically low loss, low stress and optical absorption enhancement'. It's a bit of a mouth full but basically the Cello multi-wire technology lowers electrical resistance and further increases efficiency. Trina solar have also recently started offering thin round wire busbar cells under the name multi busbar (MBB) as an option on a range of modules for 2018. As explained earlier another benefit of having more busbars is if micro-cracking does occur in a cell due to external stresses there is less chance of this forming a hotspot as the electrons have many alternative busbars to flow along. This is shown in the diagram opposite. Another recent innovation is using half cut or half size cells rather than full size square cells and moving the junction box to the center of the module. This effectively splits the solar panel into 2 smaller panels of 50% capacity each which work in parallel. This has multiple benefits including increased performance due to lower resistive losses through the bus bars (current collectors). Since each cell is half size it produces half the current at the same voltage which means the width of the busbar can be reduced by half in turn reducing cell shading and losses. The lower current also translates to lower cell temperatures which in turn reduces the potential formation and severity of hot spots due to localised shading, dirt or cell damage. In addition the shorter distance to the center of the panel from the top and bottom improves efficiency overall can boost power output of a similar sized panel by up to 20W. Another benefit is that it allows partial shading on the upper or lower part of the panel to not effect the entire power output of the panel. The REC twin peak 2 range of split panels have been available for some time and now many other manufacturers are following suit with split panels being released by Trina Solar, Q-cells, Canadian Solar, LONGi Solar, JA Solar, Risen and Jinko solar. Hanwha Q Cells have now gone one step further and introduced the Q.Peak Duo G5 series of split panels using half-cut mono PERC cells with 6 round wire busbars. This combination of cell technology improves efficiency, shade tolerance, lowers degradation and reduces the potential of hot spot formation. Bifacial solar technology has been available for several years but is starting to become popular as the cost to manufacture the very high quality monocrystalline cells required continues to decrease. Bifacial cells absorb light from both sides of the panel and in the right location and conditions can produce up to 27% more energy than traditional monofacial panels. 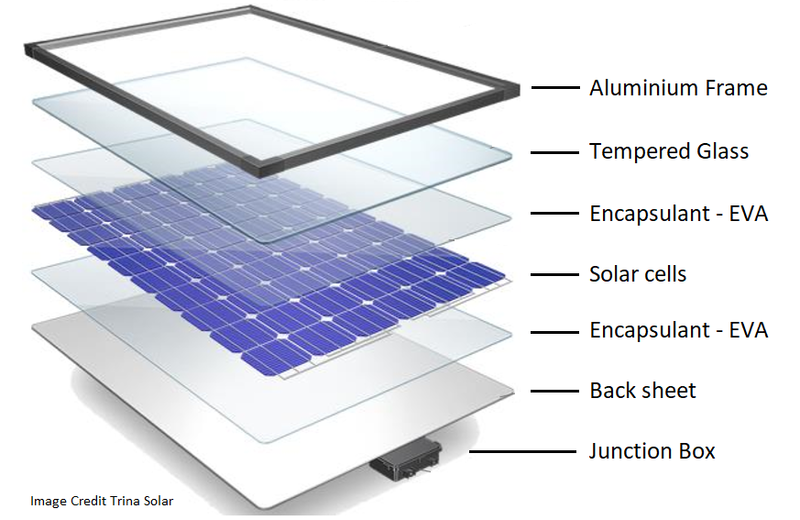 Bifacial solar panels typically use a glass front and clear rear polymer backsheet to encapsulate the cells which allows reflected light to enter from the rear side of the panel. Bifacial modules can also use a glass rear side which lasts longer and can significantly reduce the risk of failure, with some manufacturers now offering 30 year performance warranties on bifacial panel models. Traditionally bi-facial solar panels were only used in ground mounted installations in unique locations where the sunlight is easily bounced or reflected off the surrounding surfaces, in particular snow-prone regions and extreme latitudes. Although they have been proven to work well when ground mounted over light sandy surfaces and are also able to achieve up to 10% higher output even on light coloured rooftops when tilted. Manufacturers producing bifacial solar panels include LG energy, Trina solar, Jinko Solar and Yingli Solar. Many manufacturers are now producing what is known as glass-glass, dual glass or double glass solar panels which should not be confused with bifacial technology. The rear glass replaces the traditional white EVA (plastic) backsheet and creates a glass-glass sandwich which is considered superior as glass is very stable, non reactive and does not deteriorate over time or suffer from UV degradation. Due to the longer life of glass-glass panels some manufacturers such as Trina solar are now offering 30 year performance warranties. Many double glass panels are also frameless having no aluminium frame which can complicate the mounting of panels as special clamping systems are required. However frameless modules offer several advantages especially in regards to cleaning, with no frame to catch dirt and dust the frameless modules when tilted or flat are much easier to clean and are more inclined to aid from wind and rain to self-clean which results in greater solar output. However without the strength of an aluminium frame double glass panels, although more durable, are not as stiff and can appear to flex or bow, especially when mounted flat or horizontal. Manufacturers producing dual glass solar panels include Jinko solar, LONGi Solar, Trina Solar, Yingli Solar and JA solar. A new technology which is slowly becoming popular is the addition of integrated power (DC) optimisers within the solar panel. Optimsers are basically small chipsets which have the ability to bypass shaded or dirty cells that would otherwise reduce the total output of the solar array. Shading and dirt can generate hot spots over time in turn reducing the life of the panel. Separate power optimisers from companies such as Tigo and SolarEdge have been available as an add-on component for many years but now a few manufacturers are developing panels with inbuilt optimisers within the junction box on the back of the panel. Tigo energy TS4 optimisers are available as panel-integrated options or Smart panels from Jinko and Trina Solar. These can be also be added to any existing panel as an add-on optimiser with various options available. See full Tigo specifications here. A big advantage of 'add-on' optimisers such as those from Tigo and SolarEdge is the ability to monitor each solar panel individually. Micro-Inverters also have this advantage over common string inverters. Jinko Solar have introduced the Eagle MX range of solar panels using the Maxim Integrated optimiser chips. These smart chips from Maxim Integrated go beyond the traditional add-on optimiser and separate the panel into 3 strings of cells which enables the panel to operate at the optimum MPPT voltage even when partially shaded or dirty. It is worth noting that some installers have reported customers having RFI interference issues (TV & radio) using this new technology however the next generation Maxim chips are claimed to have resolved the RFI problem. Maxim Integrated solar optimisers greatly improve performance when individual cells are shaded. Shingled cells are an emerging technology which uses overlapping thin cell strips which can be assembled either horizontally or vertically across the panel. Shingled cell are made by laser cutting a normal full size cell in to 5 or 6 strips and layering them in a shingle configuration using rear side connection adhesive. The slight overlap of each cell strip hides a single busbar which interconnects the cell strips. This unique design covers more of the panel surface area as it doesn’t require front side busbar connections which partially shade the cell, thus increaseing the panel efficiency much like IBC cells explained below. Seraphrim Eclipse uses the horizontal shingles cell format. Another benefit is that the long shingled cells are usually connected in parallel which greatly reduces the effects of shading with each long cell effectively working independently. Also shingled cells are relatively cheap to manufacture so they can be a very cost effective high performance option, especially if partial shading is an issue. Seraphim were one of the first manufacturers to release shingled cell modules with there high performance Eclipse range of panels. The SunPower P series are a more recent addition to the SunPower range offering a lower cost option primarily for large scale applications. Other manufacturers producing shingled cell solar panels include Yingli Solar and Znshine. SunPower P19 series panels uses the verticle shingled cell format up to 405Wp. Along with the many cell advancements to improve efficiency there are also new technologies to increase reliability and performance over the expected 25 year life of a solar module. Solar panels can be put under extreme stress due to wind lift forces, vibrations, extreme heat and freezing cold causing expansion and contraction. These can develop micro-cracks, hot spots and PID (potential induced degradation) within the cells leading to reduced performance and accelerated failure. Manufacturers such as Winaico and LG energy have engineered extremely strong aluminium frames to help reduce cell and module stresses. Winaico's parent company Win Win Technology have gone one step further and developed what is known as 'HeatCap' Technology which is essentially a cell reinforcement structure that helps prevent micro cracks and hot spots developing when cells are under extreme stresses and loading. This technology also has the added benefit of improved performance at higher cell temperatures. Read more about HeatCap technology here. IBC silicon cells explained in detail below are not only more efficient but also much stronger than conventional cells as the rear layers reinforce the whole cell and help prevent micro-cracking which can eventually lead to failure. Sunpower use a high grade solid copper IBC rear foundation layer on their patented 'Maxeon' cell design along with a highly reflective metal mirror like surface to reflect any light which passes through back into the cell. The rear side of the 'Maxeon' IBC cell shown below is extremely tolerant to stress and bending unlike conventional cells which are relatively brittle in comparison. The rear side of a Sunpower 'Maxeon' IBC cell showing the fine metal grid conductors which improves efficiency, helps reinforce the cell and prevents micro-cracking. While PERC and bifacial are the talk of the solar world the most efficient and reliable technology is still the N-type monocrystalline cell. The first type of solar cell developed in 1954 by Bell labs used an N-type doped silicon wafer but over time the more cost effective P-type silicon became the dominant cell type with over 80% of the global market in 2017 using P-type cells. With high volume and low cost being the main driving factor behind P-type it is expected that N-type will become more popular as the manufacturing costs reduce further and efficiency increases. IBC or Interdigitated Back Contact cells have a grid of 30 or more conductors integrated into the rear side of the cell, unlike standard cells which typically have 4 to 6 large visible ribbon busbars and multiple fingers on the front side of the cell. The most obvious problem with the more common front exposed busbar design is they partially shade the cell and reflect some of the light photons which reduces efficiency, while IBC cells don't suffer this problem and as a bonus look much 'cleaner' with no exposed busbars. The world's most efficient and best performing solar panels are manufactured using IBC N-type monocrystalline silicon cells and although they are the most expensive, they are without doubt the most reliable, highest quality panels available. As of 2018 SunPower and LG are the only two manufacturers who produce solar panels with IBC N-type cells. The complete list of the most efficient solar panels in 2019. 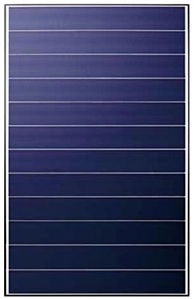 For many the higher cost of the these premium N-type solar panels ($1 or more per W) is outweighed by the higher efficiency which ranges from 20 to 22%, improved performance at higher temperatures and minimal light induced degradation (LID), which means much higher energy yield over the life of the panel. The industry leading warranty is offered on both the SunPower E and X series panels (up to 92%). As of May 2018 both the LG Neon R and Neon 2 panels are also covered by a 25 year product warranty and minimum 88% power output warranty after 25 years. HJT technology is being explored by many solar manufacturers but at present Panasonic is the only company to mass-produce panels using heterojunction cells. Following from the initial HJC development work done by UNSW and Sanyo, Panasonic created the efficient 'HIT' range of panels to become the leaders in HJT cell technology. HJT cells use a base of common crystalline silicon with additional thin film layers of amorphous silicon on either side of the cell forming what is known as the heterojunction. As opposed to the common P-N junction cells the multi-layer heterojunction cells have the potential to drastically increase efficiency with lab testing achieving efficiencies up to 26.5% when combined with IBC technology. Panasonic developed the HIT cell using a high performance N-type silicon base to produce panels with an efficiency up to 20.0% and excellent high temperature performance. The N-type silicon cells also offer exceptional long term performance guaranteeing 90.76% output after 25 years, the second highest available behind SunPower. See full specification – Panasonic HIT N335W. The most impressive characteristic of the Panasonic HIT cells is the incredibly low temperature co-efficient which is around a 40% improvement over common multi and mono crystalline cells. Panel output is rated at a cell temperature of 25 degree Celcius STC (Standard Test Conditions) and every degree above this slightly reduces power output. Temperature co-efficient refers to the measure of power reduction as cell temperature increases. In common multi and mono cells this is 0.38% to 0.42% per degree C which can add up to reduce total output by 20% or more during very hot windless days. In comparison Panasonic's HIT cells have an very low 0.26% per degC temperature co-efficient which is the lowest of any cell manufactured today. Note panel and cell temperature is also effected by roof colour, tilt angle and wind speed, so mounting panels flat on a very dark rooftop will usually reduce panel performance compared to lighter coloured rooftops. The unique Panasonic HIT panels are only available in Japan and North America, and unfortunately not currently available in Australia. Considering the high average temperatures in Australia they would be a great choice for rooftops and large scale commercial applications… hint! Solar panels are made using a series of PV cells protected by glass, EVA and a protective back sheet housed in a tough aluminium frame. The components must be engineered to withstand years of extreme weather temperatures and high wind forces. Here we explain each component in detail and why it is vital to the long term performance of a solar panel.